When Dr. Thomas Sytko’s son Christopher passed away in 1995 at the age of 26, Sytko, had an epiphany. Sytko, then 55, vowed he would no longer spend his time trying to make money, but instead would devote himself to saving lives. 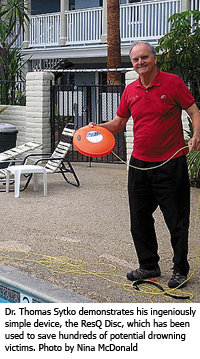 His invention, the ResQ Disc is a patented device that has saved hundreds of people from drowning. “After making my fortune twice and then having failed twice, I thought, ‘What the heck have I contributed to the world?’ After all the money I had made, I realized I really hadn’t accomplished a thing. I thought, ‘Well, I couldn’t save Chris’ life, but maybe I could save someone else’s,’” said Sytko. The son of a hot-tamale maker in Chicago, Sytko has always worked hard, first for his father and then in a variety of jobs since he was five years old. “I thought it was a vacation when I finally went to school full-time,” he said with a smile. A speed reader (900 -1200 words a minute) with a photographic memory, Sytko graduated from the University of Illinois in 1971 with a 4.9 GPA and a Ph.D. in mechanical engineering. Sytko worked in many different fields, rapidly advancing through positions of corporate responsibility and ever-increasing salary levels. Frugal and focused, by the age of 45 he was able to retire with over $800,000 in the bank and moved to California in August of 1985. In January 1996, spurred by the desire to contribute something useful to society, Sytko invented an ingeniously simple device. He had been working on the development of a pneumatic-line gun for water rescue. It occurred to him that in many drowning situations the rescuer is someone with little experience in proper lifesaving techniques. That person needs something that is easy to throw and will go a long distance while carrying an attachable line. It also needs to be buoyant enough to keep the victim afloat. As a result the ResQ Disc was born. The 12-inch bright orange disc has saved over 300 lives since Sytko began distributing the product 10 years ago. Shaped like a slightly larger Frisbee, the disc holds 100 ft. of approximately 500 lbs. test floating line coiled around its perimeter. The disc has more than 5 lbs. of buoyancy in water, just enough to lift the drowning person’s head above the water line, which any lifeguard will say is the key to calming down a panicked victim. It can be thrown accurately up to 100 ft. with little practice and reused immediately. Sytko says the disc is in use in all 50 states and by the U.S. Power Squadron, U.S. Coast Guard Auxiliary, NASA, U.S. Army Corps of Engineers, Navy SEALs and many other rescue professionals. “The Center for Disease Control (CDC) says that drowning is the leading cause of death in children ages one to five. According to the CDC last year 142,000 people drowned in the U.S. and ten times that many were near-drowning victims. Many of these victims suffer permanent brain or spinal cord damage. Most drownings occur within 30 to 70 feet from shore and are over in less than 60 seconds. The American Red Cross even recommends that it is better to ‘Throw, don’t go’” said Sytko. The operation of the device couldn’t be simpler. The top of the disc has a small indentation for a person’s thumb which helps one to keep a proper grip as it’s thrown. After the rescuer spots the victim, they unfurl about 20 feet of rope and hold the loop at the end of the rope with one hand. Using the other hand, the rescuer tosses the disc like a Frisbee. The disc will unfurl the rest of its line as it travels through the air. Due to its slight heft (it weighs just three quarters of a pound with the rope and only 12 ounces once the rope is unfurled) it is easy to accurately land the disc near a person in the water. “The rescuer should aim the disc at a spot just past the person. Its shape allows it to land flat in the water. The victim will throw their arm over the rope and as the rescuer is pulling the disc back in, the victim will eventually be ‘hooked’ by the disc which has enough flotation to lift their head up out of the water. As they hold on to the string above the disc, they can be pulled in. An untrained person can easily do this. The Coast Guard has done tests and accurately thrown the disc over 80 feet in a 20 knot wind,” said Sytko. The disc can also be used in ice rescues, where the victim will place the disc between their legs which then enables them to be hauled up enough to lift themselves out of the water onto the ice. The Coast Guard recommends it as an additional piece of equipment for boat owners. It fits neatly inside a traditional 30-inch life saving ring. It is easy to see how the disc outperforms the traditional life-saving ring or the pillow flotation devices which are required equipment on board boats. Traditional rings are cumbersome and heavy, difficult to throw any distance and are much harder to throw accurately. Flotation pillows have no lines attached to them, leaving the victim bobbing in the water. The ResQ Disc is lightweight, small enough to pack in car trunks or on any size watercraft and best of all doesn’t require the rescuer to risk their own life to save another’s. “Australian lifeguards love the ResQ Disc because they don’t have to go out into the water and deal with great white sharks,” said Sytko. The first model was too big, too heavy and the wrong shape, convex on both sides. A few permutations later, the disc edges have been significantly rounded and fattened to prevent any chance of cutting the victim when the disc is thrown. Competitors have tried to copy the disc, but Sytko says that their designs are a failure as it is too big and too heavy to be effectively and easily used. Sytko has a standing offer of a free ResQ Disc to anyone who will send him in a testimonial about saving someone from drowning. Judging from the nearly five-inch high file filled with stories from fire departments, lifeguards, police officers and ordinary people who have successfully used the disc, he has easily fulfilled his ambition to help others. Letters and newspaper articles by the dozens spill out of the file describing the rescues. Almost every story has a tone of incredulity, as if the life-saving professionals can hardly believe how such a simple tool could be so useful. In one story, a Sewall Point, Fla. police officer described saving not just a drowning victim, but also two lifeguards who had attempted to save the victim and ended up being caught in a rip tide. “It is my belief that having the [ResQ Disc] in the patrol car and having it available to the lifeguards as a lifesaving tool aided in a successful rescue of these three people,” reported Officer S.W. Donlon. Sytko, who lives in Imperial Beach, has the discs manufactured locally in San Diego County. They can be ordered on Sytko’s Web site. The discs retail for $48 including shipping and handling, however the price goes down dramatically when they are ordered in bulk. To order Click Here or call 877-222-4343 for more information. Read what some ResQ Disc™ owners have said.